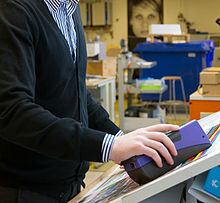 Handheld spectrophotometer used in graphic industry. Spectrophotometry is a tool that hinges on the quantitative analysis of molecules depending on how much light is absorbed by colored compounds. Spectrophotometry uses photometers, known as spectrophotometers, that can measure a light beam's intensity as a function of its color (wavelength). Important features of spectrophotometers are spectral bandwidth (the range of colors it can transmit through the test sample), the percentage of sample-transmission, the logarithmic range of sample-absorption, and sometimes a percentage of reflectance measurement. A spectrophotometer is commonly used for the measurement of transmittance or reflectance of solutions, transparent or opaque solids, such as polished glass, or gases. Although many biochemicals are colored, as in, they absorb visible light and therefore can be measured by colorimetric procedures, even colorless biochemicals can often be converted to colored compounds suitable for chromogenic color-forming reactions to yield compounds suitable for colorimetric analysis. :65 However, they can also be designed to measure the diffusivity on any of the listed light ranges that usually cover around 200 nm - 2500 nm using different controls and calibrations. Within these ranges of light, calibrations are needed on the machine using standards that vary in type depending on the wavelength of the photometric determination. An example of an experiment in which spectrophotometry is used is the determination of the equilibrium constant of a solution. A certain chemical reaction within a solution may occur in a forward and reverse direction, where reactants form products and products break down into reactants. At some point, this chemical reaction will reach a point of balance called an equilibrium point. In order to determine the respective concentrations of reactants and products at this point, the light transmittance of the solution can be tested using spectrophotometry. The amount of light that passes through the solution is indicative of the concentration of certain chemicals that do not allow light to pass through. The use of spectrophotometers spans various scientific fields, such as physics, materials science, chemistry, biochemistry,Chemical Engineering, and molecular biology. They are widely used in many industries including semiconductors, laser and optical manufacturing, printing and forensic examination, as well in laboratories for the study of chemical substances. Spectrophotometry is often used in measurements of enzyme activities, determinations of protein concentrations, determinations of enzymatic kinetic constants, and measurements of ligand binding reactions. :65 Ultimately, a spectrophotometer is able to determine, depending on the control or calibration, what substances are present in a target and exactly how much through calculations of observed wavelengths. In astronomy, the term spectrophotometry refers to the measurement of the spectrum of a celestial object in which the flux scale of the spectrum is calibrated as a function of wavelength, usually by comparison with an observation of a spectrophotometric standard star, and corrected for the absorption of light by the Earth's atmosphere. Invented by Arnold O. Beckman in 1940[disputed – discuss], the spectrophotometer was created with the aid of his colleagues at his company National Technical Laboratories founded in 1935 which would become Beckman Instrument Company and ultimately Beckman Coulter. This would come as a solution to the previously created spectrophotometers which were unable to absorb the ultraviolet correctly. He would start with the invention of Model A where a glass prism was used to absorb the UV light. It would be found that this did not give satisfactory results, therefore in Model B, there was a shift from a glass to a quartz prism which allowed for better absorbance results. From there, Model C was born with an adjustment to the wavelength resolution which ended up having three units of it produced. The last and most popular model became Model D which is better recognized now as the DU spectrophotometer which contained the instrument case, hydrogen lamp with ultraviolent continuum and a better monochromator. It was produced from 1941 to 1976 where the price for it in 1941 was US$723 (far-UV accessories were an option at additional cost). In the words of Nobel chemistry laureate Bruce Merrifield, it was "probably the most important instrument ever developed towards the advancement of bioscience." 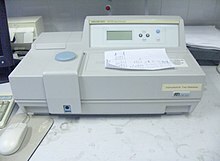 Once it became discontinued in 1976, another company known as Hewlett-Packard created the first commercially available diode-assay spectrophotometer in 1979 known as the HP 8450A. Diode-assay spectrophotometers differed from the original spectrophotometer created by Beckman because it was the first single-beam microprocessor-controlled spectrophotometer that scanned multiple wavelengths at a time in seconds. It irradiates the sample with polychromatic light which the sample absorbs depending on its properties. Then it is transmitted back by grating the photodiode array which detects the wavelength region of the spectrum. Since then, the creation and implementation of spectrophotometry devices has increased immensely and has become one of the most innovative instruments of our time. There are two major classes of devices: single beam and double beam. A double beam spectrophotometer compares the light intensity between two light paths, one path containing a reference sample and the other the test sample. A single-beam spectrophotometer measures the relative light intensity of the beam before and after a test sample is inserted. Although comparison measurements from double-beam instruments are easier and more stable, single-beam instruments can have a larger dynamic range and are optically simpler and more compact. Additionally, some specialized instruments, such as spectrophotometers built onto microscopes or telescopes, are single-beam instruments due to practicality. Historically, spectrophotometers use a monochromator containing a diffraction grating to produce the analytical spectrum. The grating can either be movable or fixed. If a single detector, such as a photomultiplier tube or photodiode is used, the grating can be scanned stepwise (scanning spectrophotometer) so that the detector can measure the light intensity at each wavelength (which will correspond to each "step"). Arrays of detectors (array spectrophotometer), such as charge coupled devices (CCD) or photodiode arrays (PDA) can also be used. In such systems, the grating is fixed and the intensity of each wavelength of light is measured by a different detector in the array. Additionally, most modern mid-infrared spectrophotometers use a Fourier transform technique to acquire the spectral information. This technique is called Fourier transform infrared spectroscopy. When making transmission measurements, the spectrophotometer quantitatively compares the fraction of light that passes through a reference solution and a test solution, then electronically compares the intensities of the two signals and computes the percentage of transmission of the sample compared to the reference standard. For reflectance measurements, the spectrophotometer quantitatively compares the fraction of light that reflects from the reference and test samples. Light from the source lamp is passed through a monochromator, which diffracts the light into a "rainbow" of wavelengths through a rotating prism and outputs narrow bandwidths of this diffracted spectrum through a mechanical slit on the output side of the monochromator. These bandwidths are transmitted through the test sample. Then the photon flux density (watts per metre squared usually) of the transmitted or reflected light is measured with a photodiode, charge coupled device or other light sensor. The transmittance or reflectance value for each wavelength of the test sample is then compared with the transmission or reflectance values from the reference sample. Most instruments will apply a logarithmic function to the linear transmittance ratio to calculate the 'absorbency' of the sample, a value which is proportional to the 'concentration' of the chemical being measured. The light source is shone into a monochromator, diffracted into a rainbow, and split into two beams. It is then scanned through the sample and the reference solutions. Fractions of the incident wavelengths are transmitted through, or reflected from, the sample and the reference. The resultant light strikes the photodetector device, which compares the relative intensity of the two beams. Electronic circuits convert the relative currents into linear transmission percentages and/or absorbance/concentration values. Many older spectrophotometers must be calibrated by a procedure known as "zeroing", to balance the null current output of the two beams at the detector. The transmission of a reference substance is set as a baseline (datum) value, so the transmission of all other substances are recorded relative to the initial "zeroed" substance. The spectrophotometer then converts the transmission ratio into 'absorbency', the concentration of specific components of the test sample relative to the initial substance. , in order to determine various relationships between transmittance and concentration, and absorbance and concentration. :21-119 Because a spectrophotometer measures the wavelength of a compound through its color, a dye binding substance can be added so that it can undergo a color change and be measured. It is possible to know the concentrations of a two component mixture using the absorption spectra of the standard solutions of each component. To do this, it is necessary to know the extinction coefficient of this mixture at two wave lengths and the extinction coefficients of solutions that contain the known weights of the two components. Spectrophotometers have been developed and improved over decades and have been widely used among chemists. Additionally, Spectrophotometers are specialized to measure either UV or Visible light wavelength absorbance values. :21-119 It is considered to be a highly accurate instrument that is also very sensitive and therefore extremely precise, especially in determining color change. This method is also convenient for use in laboratory experiments because it is an inexpensive and relatively simple process. Ultraviolet-visible (UV-vis) spectroscopy involves energy levels that excite electronic transitions. Absorption of UV-vis light excites molecules that are in ground-states to their excited-states. Visible region 400–700 nm spectrophotometry is used extensively in colorimetry science. It is a known fact that it operates best at the range of 0.2-0.8 O.D. Ink manufacturers, printing companies, textiles vendors, and many more, need the data provided through colorimetry. They take readings in the region of every 5–20 nanometers along the visible region, and produce a spectral reflectance curve or a data stream for alternative presentations. These curves can be used to test a new batch of colorant to check if it makes a match to specifications, e.g., ISO printing standards. Traditional visible region spectrophotometers cannot detect if a colorant or the base material has fluorescence. This can make it difficult to manage color issues if for example one or more of the printing inks is fluorescent. Where a colorant contains fluorescence, a bi-spectral fluorescent spectrophotometer is used. There are two major setups for visual spectrum spectrophotometers, d/8 (spherical) and 0/45. The names are due to the geometry of the light source, observer and interior of the measurement chamber. Scientists use this instrument to measure the amount of compounds in a sample. If the compound is more concentrated more light will be absorbed by the sample; within small ranges, the Beer-Lambert law holds and the absorbance between samples vary with concentration linearly. In the case of printing measurements two alternative settings are commonly used- without/with uv filter to control better the effect of uv brighteners within the paper stock. Samples are usually prepared in cuvettes; depending on the region of interest, they may be constructed of glass, plastic (visible spectrum region of interest), or quartz (Far UV spectrum region of interest). Some applications require small volume measurements which can be performed with micro-volume platforms. As described in the applications section, spectrophotometry can be used in both qualitative and quantitative analysis of DNA, RNA, and proteins. Qualitative analysis can be used and spectrophotometers are used to record spectra of compounds by scanning broad wavelength regions to determine the absorbance properties (the intensity of the color) of the compound at each wavelength. One experiment that can demonstrate the various uses that visible spectrophotometry can have is the separation of β-galactosidase from a mixture of various proteins. Largely, spectrophotometry is best used to help quantify the amount of purification your sample has undergone relative to total protein concentration. By running an affinity chromatography, B-Galactosidase can be isolated and tested by reacting collected samples with ONPG and determining if the sample turns yellow. :21-119 Following this testing the sample at 420 nm for specific interaction with ONPG and at 595 for a Bradford Assay the amount of purification can be assessed quantitatively. :21-119 In addition to this spectrophotometry can be used in tandem with other techniques such as SDS-Page electrophoresis in order to purify and isolate various protein samples. Spectrophotometers designed for the infrared region are quite different because of the technical requirements of measurement in that region. One major factor is the type of photosensors that are available for different spectral regions, but infrared measurement is also challenging because virtually everything emits IR light as thermal radiation, especially at wavelengths beyond about 5 μm. ^ ISO 12647-2: Graphic technology — Process control for the production of halftone colour separations, proof and production prints — Part 2: Offset lithographic processes. Geneva: International Organization for Standardization. 2013. p. 13. ^ a b Allen, DW; Cooksey, C; Tsai, BK (Nov 13, 2009). "Spectrophotometry". NIST. Retrieved Dec 23, 2018. ^ a b c d e f g h i j Ninfa AJ, Ballou DP, Benore M (2010). Fundamental Laboratory Approaches for Biochemistry and Biotechnology (2nd ed.). Hoboken: Wiley & Sons. ISBN 9780470087664. OCLC 488246403. ^ Schwedt G (1997). The essential guide to analytical chemistry. Translated by Brooks H. Chichester, NY: Wiley. pp. 16–17. ISBN 9780471974123. OCLC 36543293. ^ a b c Ninfa AJ, Ballou DP (2004). Fundamental laboratory approaches for biochemistry and biotechnology. Hoboken: Wiley. p. 66. ISBN 9781891786006. OCLC 633862582. ^ a b Rendina G (1976). Experimental Methods in Modern Biochemistry. Philadelphia, PA: W. B. Saunders Company. pp. 46–55. ISBN 0721675506. OCLC 147990. ^ Ishani, G (2006). "The first commercial UV-vis spectrophotometer". The Scientist. p. 100. Retrieved Dec 23, 2018 – via Science In Context. ^ Simoni, RD; Hill, RL; Vaughan, M; Tabor, H (Dec 5, 2003). "A Classic Instrument: The Beckman DU Spectrophotometer and Its Inventor, Arnold O. Beckman". J. Biol. Chem. 278 (49): e1. ISSN 1083-351X. ^ Beckman, A. O.; Gallaway, W. S.; Kaye, W.; Ulrich, W. F. (March 1977). "History of spectrophotometry at Beckman Instruments, Inc". Analytical Chemistry. 49 (3): 280A–300A. doi:10.1021/ac50011a001. ^ "Hewlett Packard: Compound Identification with HP 8450 A UV Visible Spectrophotometer". Analytical Chemistry. 51 (12): 1188A–1189A. 1979-10-01. doi:10.1021/ac50048a728. ISSN 0003-2700. ^ Ninfa AJ, Ballou DP, Benore M (2015). Fundamental Laboratory Approaches for Biochemistry and Biotechnology (3, rev. ed.). Hoboken, NJ: Wiley & Sons. p. 77. ISBN 9780470924525. OCLC 915641828. ^ "Fully Automatic Double Beam - Atomic Absorption Spectrophotometer (AA 8000)". Laboratory Equipment. Labindia Analytical Instruments Pvt. Ltd.
^ "Spectrophotometry Applications and Fundamentals". www.mt.com. Mettler-Toledo International Inc. Retrieved Jul 4, 2018. ^ Trumbo, Toni A.; Schultz, Emeric; Borland, Michael G.; Pugh, Michael Eugene (April 27, 2013). "Applied Spectrophotometry: Analysis of a Biochemical Mixture". Biochemistry and Molecular Biology Education. 41 (4): 242–50. doi:10.1002/bmb.20694. PMID 23625877. ^ "FastTrack™ UV/VIS Spectroscopy" (PDF). www.mt.com. Mettler-Toledo AG, Analytical. 2016. Retrieved Dec 23, 2018. ^ Cortez, C.; Szepaniuk, A.; Gomes da Silva, L. (May 1, 2010). "Exploring Proteins Purification Techniques Animations as Tools for the Biochemistry Teaching". Journal of Biochemistry Education. 8 (2): 12. doi:10.16923/reb.v8i2.215. ^ Garrett RH, Grisham CM (2013). Biochemistry. Belmont, CA: Cengage. p. 106. ISBN 978-1133106296. OCLC 801650341. ^ Holiday, Ensor Roslyn (May 27, 1936). "Spectrophotometry of proteins". Biochemical Journal. 30 (10): 1795–1803. doi:10.1042/bj0301795. PMC 1263262. PMID 16746224. ^ Mavrodineanu R, Schultz JI, Menis O, eds. (1973). Accuracy in Spectrophotometry and Luminescence Measurements: Proceedings. Washington, D.C.: U.S. National Bureau of Standards. p. 2. OCLC 920079. Wikimedia Commons has media related to Spectrophotometry.